Trying to make plans for your holidays? Don't worry, there is always something going on in the city of Krk.No matter your interest there is something for everyone. You can find amazing events taking place in Krk - from bycicle races, regattas, music festivals and live performances, to traditional celebrations, fairs and exibitions. Something for everyone! Check our event calendar and book your holiday so you can enjoy your holiday even more. Besides these scheduled events, the weekly performances by folklore companies, choirs and brass music will be organized as well. Programmes on the occasion of celebrating St Quirinus, patron of Krk Diocese and the city of Krk, organized by the Centre for Culture of the City of Krk. One-day festival of electronic music, a festival of young DJs and bands that playing electronic music. Photo exhibition at the Krk Waterfront on the theme of games by the sea. Jazz/ethno concert on the square ¨Krčkih glagoljaša¨. Say hello to the first days of summer, with various artists and Marko Tolja who will bring warm sounds to the Krk Waterfront. Regatta in the waters of Krk. Traditional cultural events organized during the summer months, a programme of events complex of musical and theatrical displays of classical music concerts, ballet and drama. International Folklore Festival on the Krk Waterfront. International Beach Volleyball Tournament and Croatian Championship at the beach Dunat. Live music on the Vela placa Square. Croatian international championship in orienteering. 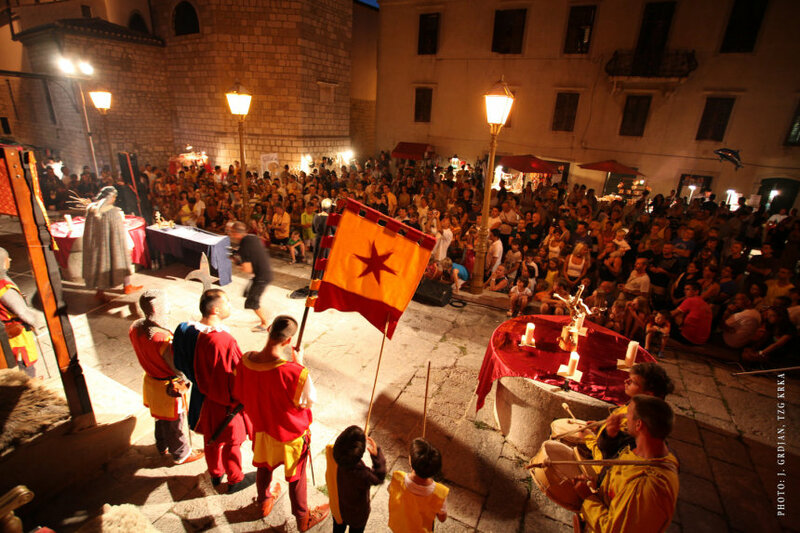 In these three days the city of Krk is transformed into a huge stage on which scenes from the Middle Ages alternate with those of modern times, all accompanied with entertainment, cultural, commercial and gastronomic offer which will present all the best offered by the island of Krk and the entire Croatia. The Krk Fair should not be missed! Night sailing with live music in the eve of the fest of the Assumption, entertainment program on Krk waterfront. Regatta of old vessels organized in Krk waters, Regatta starts at noon, in the evening there will be an entertainment program on the Krk Waterfront. Promenade concert of brass band. Traditional rock festival of Krk demo bands organized by an Krk Associoatin ¨Kreativni Krk¨, designed as an opportunity to present the rich demo scene of the island Krk. *The event calendar is subject to change!